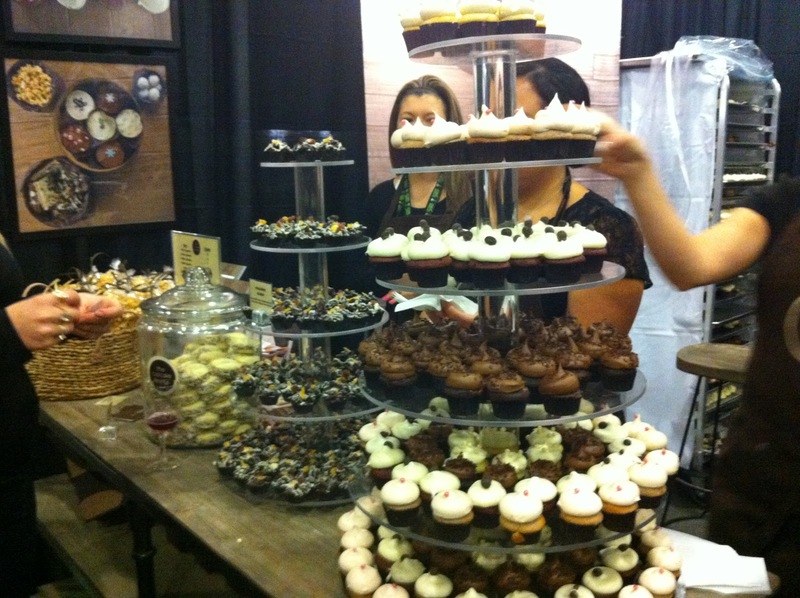 Ottawa Wine and Food Show - to go? Or not to go? Having attended Bon Appetit and Taste in the Glebe in the past year (which were much better organized, less crowded and lacking the miniskirt-clad hard-core party goers) I was pretty sure I'd written off OWFF. But then a week before the big day, I casually mentioned it to Hubby, who texted back his reply in all caps: "YEAH!" So off we went. Yeah, twist my rubber arm. New this year was the "best of show" tasting room, where the top red and white of the festival were showcased alongside some nibblies. The Alpine Valley 2011 Sauvignon Blanc (New Zealand; 13% abv; L241810; $14.95) had a full mouthfeel and pronounced sweetness to mellow out the standard crazy acidity that comes with NZ s.blancs. But it was the Coyote's Run 2010 Red Paw Vineyard Pinot Noir (Niagara; 12.5% abv; V79228 $24.95) that wore the crown with elegance and just a wee bit of well-deserved show-off swagger. A complex nose of coffee, chocolate, leather and tobacco, with a plush silkiness on the tongue, perfect balance and flavourful finish. Palatine 2011 Quattro (Niagara; 13% abv; L305383 $14.95) - Riesling, Gewurztraminer, Chardonnay and Sauvignon Blanc blend. Subtle floral notes but with tropical fruit flavours that burst on the tongue. Slightly viscous texture with a bit of zip and a tangy apricot finish. Thinking spicy Thai with this, for sure. Finca Nueva 2010 Fermentado en Barrica Blanco (Spain; 13% abv; V280560 $15.95) - Meaning "barrel fermented" this blend of viura and malvasia is a luscious alternative to gewurz for the fragrance factor, and another white blend worth sipping pre-dinner. Caramelized butter and floral aromas are a stark contrast to what's on the palate: a resinous, woody taste of pine nuts, mint and herbaceous undergrowth. In a good way. Marqués de Riscal Rioja Reserva (Spain; 13.5% abv; L32656) - Immediately dubbed the 'Red Rascal'. Predominantly tempranillo, with graciano and mazuelo added in. Meaty, smoky and robust, with firm tannins and gobs of dark chocolate. Similar to the Hoya de Cadenas, but with more oomph. The best pairing of the afternoon had nothing at all to do with wine or any of the savoury samples that crossed my lips. It all started with a Granville Island Brewery Lions Winter Ale (giddy up, it's at the Beer Store!) Warm vanilla and chocolate, this ale made of specialty hops was full, chewy and thick with flavour. I took a sip and knew of only one thing that could live up to such ambrosial aromas. Making a beeline for the Cupcake Lounge booth, I grabbed a mini double-chocolate and then kicked back to let my tastebuds vacation in la-la-land. Ohm nom nom nom nom ... I'm soooooo picking some up for the holidays. Now that I think of it, I think a wine-and-beer (and spirits?) tasting with CUPCAKES would be awesome. Don't you?